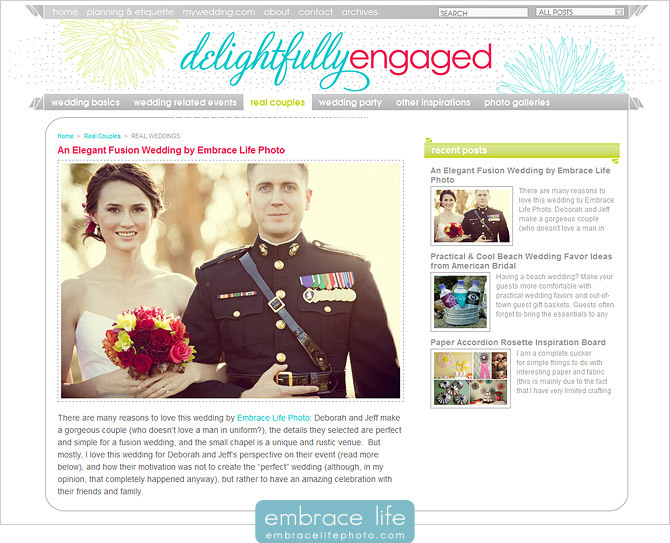 We were very excited and honored when Delightfully Engaged asked if they could share Deborah and Jeff’s Camp Pendleton Wedding photography with their readers. Delightfully Engaged editor, Sarah Pierce, did a great job presenting the images and telling Deborah and Jeff’s story. Here’s a link to our featured photography. Thank you, Sarah! Just last month in honor of Memorial Day, we also posted their beautiful, fusion San Diego military wedding photography.